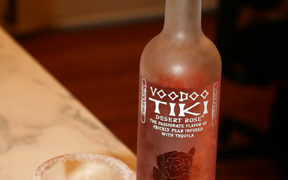 A note about reviewing alcohol: I realize that not a lot of blogs like this one will review “adult” products. My general feeling is that I’m an adult, my fellow testers are adults, and a lot of you, my readers, are adults. Many of us have had alcoholic beverages before – some people maybe more than others. As long as we are drinking responsibly (and legally,) then I don’t see any reason why the “adult” aspect of our lives is not mentioned. And with that disclaimer, on with the review. I’ll admit that the closest thing to alcoholic cider I’d ever had before this weekend was when my family opened a VERY old bottle of sparkling apple cider. So old, that it tasted “funny” and by the end of the dinner, we were all laughing at things that weren’t really that funny. 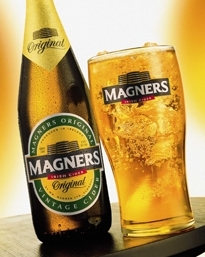 Saturday night, I had an opportunity to sample the REAL DEAL – Magners Irish Cider. It’s important for me to note that I am a “light-weight.” I’ve never been a heavy drinker and will only occasionally order a “girly” drink if it’s a special occasion. So for this review, I recruited some friends who are more “experienced” in the alcoholic beverage arena – to ensure that palettes that know what’s good and what’s bad are doing the tasting. Made from 17 varieties of apple cider, Magners Irish Cider is a 100% Gluten free, sparkling beverage that’s best served cold. My sample was thrown into the fridge to get nice and cold, and then carefully split 4 ways. Suggested food pairings for Magners includes cheese appetizers, salmon, pork, poultry, and spicy Asian entrees, and desserts. We had ours after a dessert of delicious lemon bread. You can also cook with the Magners, using it as a sauce or glaze, but unfortunately, I didn’t get a chance to test any of their recipes. I will post the recipes I do have later for those of you feeling culinary. Across the board, all tasters thought Magners Irish Cider was very good. And, with just 4.5% alcohol and only 125 calories, it qualifies as a “girly” drink and one that I could see myself drinking again. What's Cooking at DD >>>> D D D D D d.d.d.d.d Dance! Thanks Eudos! I think it's awesome, and find myself singing “D-d-d-d-d-DANCE!” randomly throughout the day. Thanks Eudos! I think it's awesome, and find myself singing “D-d-d-d-d-DANCE!” randomly throughout the day.DANCE! Braised Beef Brisket with Mild Chili SauceThanks for the chance to win a Prize! Although I have never heard of Magner’s Apple Cider it sounds like it must be one of the best and I shall see if my store/liquor store carries it. I also love the suggestions.